Inverhuron Bay once considered safest harbour in area. Standing on the boardwalk overlooking Inverhuron Bay on an August day, it is hard to imagine that this shallow body of blue water dominated by breakers was ever called the safest harbour from the Detroit River to the Fishing Islands. Still, hundreds of happy campers swim there while sailboats and motor launches bob about off shore. Get out a map of Ontario and take a look at the Huron Shore, those several hundred kilometres from Point Edward to Chief’s Point at Sauble Beach. Run your finger north, pausing at Grand Bend, Bayfield, Goderich, Kincardine, Port Elgin, and Southampton. Can you imagine along that inhospitable shoreline a bay of sufficient size, protected from the wind, and free of reefs and shoals to allow a fully rigged schooner to ride out a storm? In the early years of navigation on Lake Huron, the eastern shore was marked by rocks, shoals and shallow water. Navigation was difficult with many wrecks and lives lost, especially when the wind rose out of the southwest, pounding vessels to pieces, schooners and steamers that ventured too close to land. And yet, the waters of the lake were the main highways for the scattered settlements that began to dot the coast in the middle of the 19th century. The lake and connecting waterways were the lifelines for settlements. Long before the first rough roads were carved out of the bush, vessels connected coastal villages and towns, hauling passengers, mail, dry goods, mill machinery and even livestock between ports. Beginning in the late 1850s, a series of lighthouses began to appear, lighting up the coast, warning of obstacles or offering a welcome to the questionable safety of a harbour. Still, the light stations at Point Clark and on Chantry Island, the Goderich light standing high on a bluff, or the harbour lighthouses at Kincardine and Port Elgin did little to stem the loss of ships and shipping. What was needed was a Harbour of Refuge, a government sanctioned and funded, breakwater-protected and well engineered pool of safety that would allow even the largest ship to find peaceful waters on a stormy night. We spent nearly a week early in August, camped at Inverhuron Provincial Park where daily I walked the beach or swam in the rockstudded bay, either from the sand beach or off limestone pavement. And while walking the wrack line where the winds of winter drive flotsam ashore, I found old timbers and planks, evidence that once long ago, ships came to distress along Inverhuron Bay. The term “Harbour of Refuge” resounded with the citizens of any potential port on the Canadian Great Lakes. In the 19th century, that designation came from the federal government along with the funds needed to create such a basin of safety. Ports along unprotected shores such as Lake Huron competed with each other for money to build piers and breakwaters, expensive man-made shelters from storms. With railways and improved roads looming, port boosters such as those at Inverhuron launched a campaign to secure funds for a Harbour of Refuge. Inverhuron had already benefitted from government largesse, spending over $15,000 to build a dock over 500 feet into 20 feet of water. Its remains can still be found just south of the Little Sauble River in the form of old rock cribs and water-washed timbers. In 1858, the Scottish engineer Sandford Fleming surveyed Inverhuron Bay for the Board of Public Works. His report was positive stating, “and in view of the importance of a safe refuge, easy access for vessels during adverse winds, I am strongly of the opinion that it would justify even a large expenditure as a Provincial undertaking.” The estimated cost would be 17,000 pounds sterling. Inverhuron’s champions were nothing if not persistent. In February 1907 they were at it again. Two delegations went to Ottawa to press the issue for a harbour of refuge. The Paisley Advocate explained. Then came the Great Storm of November 1913 when eight vessels were lost on Lake Huron with all hands drowning. The effect on the backers of a Harbour of Refuge was immediate. No harbour of refuge was ever built at Inverhuron Bay. Instead, government funds were directed to Southampton where in 1877, a pier was extended from the north end of Chantry Island to the mainland. There was a gap in the dock for ships to enter. Sad to say, many a skipper brought his vessel to its final end while trying to shoot the gap at Southampton. In the long run, only the harbour at Goderich was considered a safe shipping port. The years went by spelling the end of the coastal trade along the Huron Coast. Trucks and cars and railroads replaced the lake route, leaving the many small harbours to fishing vessels and later, pleasure craft. Today, the waves still roll in onto the sands at Inverhuron. They can grow in size and sound when a southwesterly is blowing. On some blustery days, it is even possible to surf those wild waters while trying to imagine a fully loaded schooner fighting for an anchorage in the bay. Inverhuron seasonal resident Jim Skelding is sharing his passion for postcards with the community through his new book highlighting the early era of the postcard in the local lake-side area. 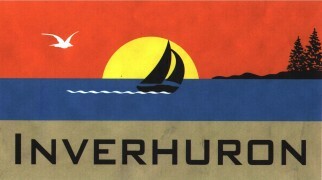 "Inverhuron: A Postcard Reflective" features 95 postcards from the Inverhuron area dating between 1907 and 1960. Skelding introduced his book and was a guest speaker at the Township of Bruce Historical Society dinner at the Bruce Twp. Community Centre on Friday, June 3. A resident of Merrickville in the off-season, Skelding has over 1,000 post cards and focuses his time on his two favourite places, along with the Thousand Islands and other "oddball" interests as he described. In Inverhuron's case, the book reflects the collection he's assembled over the last 20 years, many of which have been tracked down in online auctions over the last couple of years. "It's the hunt that's interest. Once you've seen something you've never seen before, you go after it," said Skelding. "Some are competitive, some are not. It's been fairly easy lately." Inverhuron is dear to his family, since his grandfather built a cottage around 1930. Now his brother, two sisters and his daughter all cottage in the area during the summer. One post card features his grandfather on a ladder around that time, while in a second he could see himself as a child sitting on the beach. Others have local people who still cottage in the area, along with local landmarks that are still notable today. "The flagpole, Inverhuron's point, are all so distinctive," he said. "I think the local people will take great interest in it." A total of 500 copies have bee printed, with some available at the two antique stores in Tiverton, he said. T-Shirts are now available marking the occasion. at the recent Inverhuron Safety Day. Don't miss the IDRA Corn Roast at Inverhuron's McIntyre Park on Sept. 3. The Inverhuron and District Ratepayers' Association (IDRA) was established in 1978 in order to broaden the scope of the original association to include both seasonal and permanent residents of Inverhuron Beach. 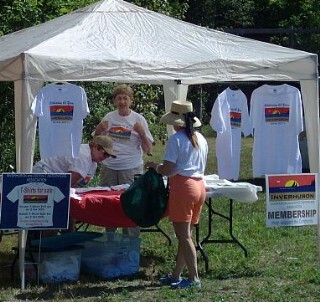 Previously known as the Inverhuron Beach Association (founded in 1946), the mandate of the new association be to promote cultural, social, aquatic, and family activities as well as to study, report and represent the residents relative to local or provincial government, or private sector initiatives or plans that would affect Inverhuron and it's residents. The Inverhuron and District Ratepayers' Association publishes a directory every second year which lists the names, addresses,e-mail and telephone numbers of the residents. This Directory is subsidized by advertising from local businesses and is available at the Cottage Grocery on Albert Road. Residents may join the IDRA for a nominal fee of $20. Membership Forms are available at the Cottage Grocery or through the members of the Board of Directors. This year the Board of the IDRA has organize popular activities such as the Summer Games Day held on July 2 as well as a Yard and Bake Sale, Safety Education Day on Aug. 1 and the annual Corn Roast over the Labour Day week-end when the annual meeting of all residents is held. To date, 25 Past-Presidents of the Association have been issued a special invitation to attend the Corn Roast on Sept. 3. We wish to salute their efforts and thank them for the time that they have voluntarily given to their neighbours. Since 2011 is the 65th Anniversary of the reconstituted IDRA, a celebratory T-shirt has been made available to interested parties featuring the Inverhuron Flag and the dates of the Association's 65 years. click to view the up to date IDRA website .